For many ecommerce sites, sites with hundreds of mostly duplicated pages, and others, fixing thin content may seem like an impossible goal. But thin content is the opposite of the unique, relevant quality content that search engines want to show on results pages. Thin content can hurt a website’s SEO and revenue. What’s the worst that can happen? Websites can incur manual penalties from Google for having “Thin content with little or no added value” (see this Google Help video for Matt Cutts’s explanation and our tutorial on avoiding Google penalties for more detail). Other times, sites may experience sudden drops in organic search traffic as evidence of an algorithmic penalty (usually Panda-related). Either way, penalty actions reduce website traffic and impact the bottom line. What can a website do to fix thin content? 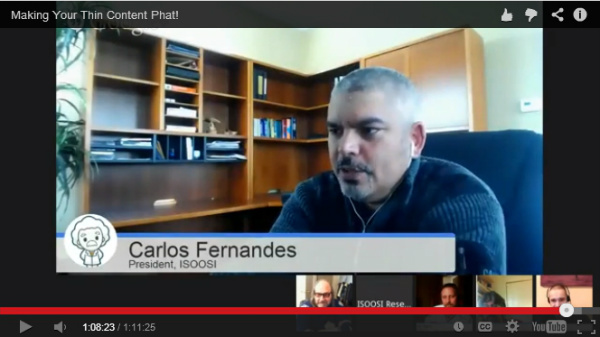 Last week’s ISOOSI Tuesday Chat, a Google+ Hangout-on-Air hosted by ISOOSI Research Engine, dealt with this issue. In Making Your Thin Content Phat!, host and ISOOSI President Carlos Fernandes talked with four Internet marketing experts: Ammon Johns, David Harry, Terry Van Horne and Bill Slawski. What follows are the questions, problems and solutions this panel of experts discussed during the Hangout. Thin content isn’t about the amount of content, but the quality. Here are general tips for content creation that will keep you clear of Google’s thin content traps. Reword to create original content: Don’t copy other people’s content, but reword it. Aggregate all the different answers so that yours is the best result. Review your content: To evaluate your content, ask “normal people,” because you are too close to it. Websites wanting to do business in many different cities often set up “location pages” to help them rank for location-based searches. When these are created using a boilerplate template with just a “fill-in-the-blank” approach to change the place names, the same content gets duplicated across hundreds or thousands of pages. And that’s the kind of “thin content” Google’s Panda algorithm seeks to eliminate. Location pages are identical except for one or two words, so they’re thin content. There’s contention even among experts over whether there’s a reason to ever have pages for different locations anymore. Adversely, it could be argued that location-specific content is a value add. Carlos reported that having region-specific pages on his website had brought him a $352 million inquiry just that week. They want a local office where they can talk face-to-face. They want to stay within a fixed radius. They want someone who understands special local issues (e.g., getting homeowner’s insurance if you live in tornado alley). Have local experts add content. The site can be a framework, and local subject matter experts can help create the content. Example: Lawyer sites might have pages about drunk driving charges, and that content can vary from state to state (e.g., laws, penalties, even what the charge is called). Lawyers in each state know the subject well, so have them create location-specific content. Refer to past sales data. If a particular product has sold well in a specific area, talk about that product on that location page. Consider taking your location pages down. If you can’t make each page different with location-specific unique content that fulfills the searcher’s intent, it would be better from an SEO perspective not to have location pages at all. On an ecommerce site, users can view pages with filtered results, such as by brand, by size, by product type, or by other attributes. These “filtered results” pages have a unique URL that can be indexed by the search engines. The problem is, since none of the content is unique on those pages, they create a nightmare of duplicate, thin content. In a worst case scenario, a site with only 3,000 products may have 40,000 pages indexed, which makes no sense. Google can and will penalize ecommerce sites for this situation. But should you struggle with making those pages unique? Most sites do not need to rank for product attributes, and having so many filtered pages dilutes the site’s internal link equity anyway. Again, the goal is to put some unique content on every page that will be indexed for search. Barring that, the other choice is to prevent non-unique pages from being indexed at all. Use the URL Parameter tool. In Google Webmaster Tools, the URL Parameter tool lets you tell Google how to handle URLs containing specific parameters (see GWT Help for more details). Remove filtered results pages from the search engine index. If you cannot add any unique content, then remove the pages from the search index. One way to do so is using the Page Removal tool in Google Webmaster Tools. Block indexing using robots.txt. Another way to prevent duplicate content pages is to exclude them in your robots.txt file (see our Robots.txt guide for help). This stops the search engine from indexing your filtered results pages. Ecommerce product pages commonly have two problems that cause thin content: duplicated manufacturer descriptions and repeated text for terms of service and shipping information. Many ecommerce sites take boilerplate, manufacturer-provided text and paste it into their product pages. Manufacturer product descriptions can be found all over the web, so these duplicate product pages can trigger search engine penalties. It’s also problematic when lengthy blocks of text for terms of service and shipping information are repeated across all product pages. For this problem, there is only one solution: make original content for each product page. This can be a monumental task for sites with thousands of products, but necessary. Replace manufacturer text. Rewrite the standard manufacturer text with unique descriptive content for each product. Make sure repeated text doesn’t overwhelm original content. 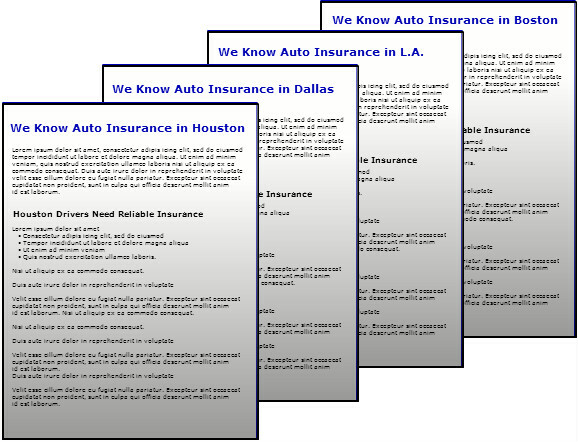 Terms of service, shipping information, and similar text can be 400 to 500 words, which is a large percentage of the body copy. Be careful to “flesh out” the product information enough so that there’s original content to balance out the duplicated text. There’s a type of content that has become commonplace on the web today: “me too” blog posts, which may be 2000-word articles about things people have already read elsewhere. These posts are not true curations because they have no added value and nothing original. While you might think “thin content” means not enough words, that’s incorrect; long posts can be considered “thin,” too. Curate content, don’t duplicate it. Curate content by synthesizing ideas and adding original thoughts. Read more about SEO best practices for content curation (make sure to use unique text, high quality links, and add value) if you’re cleaning up “me too” thin content. Don’t just copy and paste. Duplicate content adds no value for the reader and could be penalized by the search engines. Don’t do it. The ISOOSI Chat happens every Tuesday at 12:00 Pacific time on Google+. All are welcome. my web site had Thin content with little or no added value so I tried everything but could not get the results Please could you help me? Henk: “I soon realized however that content has to be quality over quantity …” — How did you learn that lesson? I bet there’s a story there. But yes, content is king more than ever. I was always taught that content is king so I added as much content as I could to my sites no matter if it was good or bad. I soon realized however that content has to be quality over quantity and I never looked back after that. Heather: You’re welcome, and that’s so true. Quality takes effort, but increasingly that’s the only type of content getting rewarded. So it’s worth the work. Good write up and information, thanks, Paula. Can’t stress enough, these days, the importance of quality content over quantity. Appreciate you sharing your knowledge with us! This post helps in dissecting and doing away with thin contents. The common scenarios dissected affects relatively many websites today. Well, the practicality of the solutions offered here is impressive. Its time to apply the procedures recommended for each! This comment was left in kingged.com – the content syndication and content aggregation website where this post was bookmarked. Dillip: In our experience, a website can recover from Panda. However, it typically means that a lot of work is involved, and not every site owner is up for the challenge. Our recommendations generally include consolidating thin content pages, writing new content that is relevant to the theme(s) of the website, and revising pages. It’s definitely not a simple process. Plus, there’s no guarantee that the website will rank as high as it did before being hit by Panda. Adding to your point, we have questioned whether sites following Panda have a real reason to exist and if there might need to be a change in the business model. For example, if the site was a directory with very little original content, it’s going to have a hard time ranking in today’s Google. Changing how the site functions, such as adding user-generated content may be necessary, especially if it’s impossible for the site to write relevant content for all pages. Almost everything is covered regarding thin content (as per your initial advice to avoid Panda). One question I want to put here; can all Panda penalty be reversible? Specially when a very big site got this due to thin content issue. I happened to find opportunity to analyze two big sites (one used to get more than 130000 visits/day & other get 65000 visits/day before the penalty in 2011). first one is just a directory like site and other has all most 50000 pages full of thin content but original one. After so many falls promises from other SEOs to solve the issue and predictable results, they came to me for analysis and I sincerely told them though the penalty can’t be withdrawn fully to get back the previous position, but to certain extent part of the traffic can be regained. I don’t know whether expert SEOs will agree with me or not but I feel in some peculiar cases, Panda can’t be reversible. I feel Panda reflects the shifting attitude of Google towards assigning quality tag for ranking purposes and due to this changes, certain sites those used to get top ranking just for the sake of their size and popularity have seen the dropdown. I don’t know to what extent I’m right. Just feel like that. I’ve a similar post on Panda issue in my blog http://www.suvaance.com/search-engine-optimization-2014-part-learning-panda-updates-2013/. If you could have a look and give your valuable suggestion, it’ll be a great help for me. Thanks in advance. Ammon Johns: We were happy to extract and share the many actionable tips you discussed. As a side note, the ISOOSI Tuesday Chat was the top-rated Google+ Hangout our readers recommended we attend when our managing editor, Virginia Nussey, recently took a poll. We were not disappointed! The chat covered a ton of practical, excellent information. Wow, what a fantastic job of covering that hangout! This is an awesome write-up, and a perfect example of curation with a ton of added value. Thanks so much in covering this and helping to spread the message, Paula.